More than 80 years after its initial publication, Halley s Bible Handbook remains a bestseller in its various editions, with millions of copies sold worldwide. Now available in this large print edition, this world-renowned Bible handbook has been consistently updated and revised to accurately provide even greater clarity, insight, and usefulness. Halley s Bible Handbook makes the Bible s wisdom and message accessible to people from all walks of life. Whether they ve read the Bible many times or never before, readers will find insights that give them a firm grasp of God s Word and an appreciation for the cultural, religious, and geographic settings in which the story of the Bible unfolds. Written for both mind and heart, this completely revised, updated, and expanded 25th edition retains Dr. Halley's highly personal style. 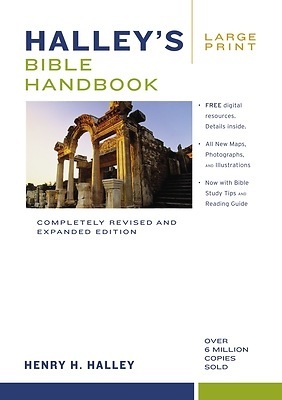 It features: All-new maps, photographs, and illustrations Contemporary design Practical Bible reading programs Helpful tips for Bible study Fascinating archaeological information Easy-to-understand sections on how we got the Bible and on church history Improved indexes"